Slam dunk! NBA teams are using the iPad for scouting and player development. More than half the teams are either using the Apple tablet or considering it. We’ve seen iPad in enterprise, iPad in government, and iPad in education. Now, iPad meets professional sports. The real Playbook tablet? There’s an app for that. 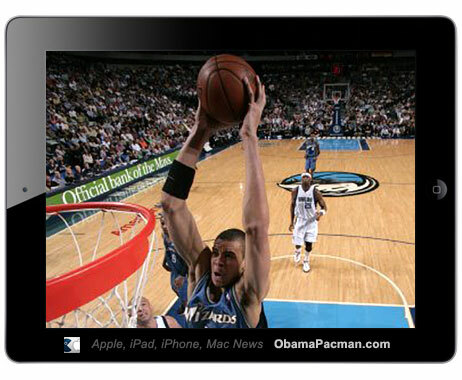 Slam Online reports in ‘iPad is NBA’s New Best Friend‘ on how various NBA teams are using the Apple iPad to their advantage. Over half the NBA teams are either using the iPad or considering it for next season. 10 NBA teams (Wizards, Timberwolves, Hawks, Hornets, and Rockets + 5 more) are already using iPads, with 6 more teams are considering using the iPad next season. “As an organization, we try to use what’s best out there… We look at costs, but we’re trying to improve and make things more efficient. Wow, iPad a slam dunk. The actual 10 hour iPad battery life for video, and iPad speed probably played a role the Apple tablet adoption too. This entry was posted on Thursday, April 7th, 2011 at 11:18 pm	and is filed under iPad. You can follow any responses to this entry through the RSS 2.0 feed.